Optional Single Supplement: $828 USD (number of singles limited). 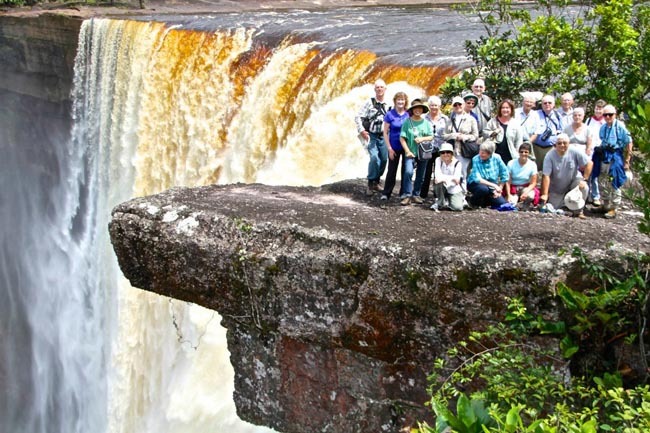 On our Guyana, Suriname & French Guiana tour, sandy beaches, tropical climate and friendly people all work their way into defining this area of the continent. When we venture to the only English-speaking country in South America, Guyana, and into its capital, Georgetown, we see the past clearly shine through the numerous colonial buildings and the gardens that surround them. 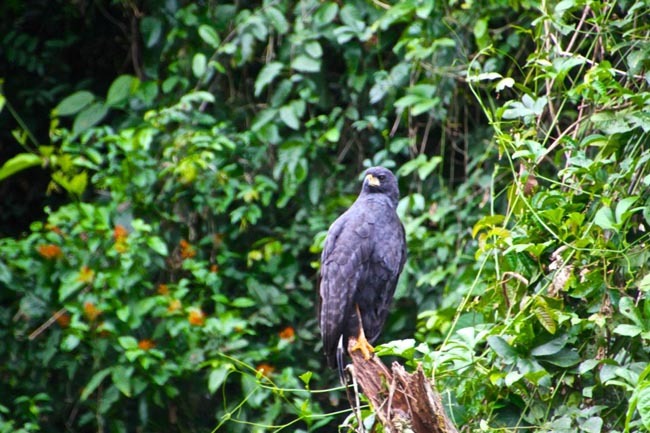 During this trip, we will have a chance to see an outstanding array of birds, from the 200-plus species in the vast rainforest of the Baganara Resort, or the hundreds of birds. While strolling down the Central Market of Paramaribo, Suriname, be sure to taste some of the delicious tropical fruits unique to the area. A major highlight is our remote wilderness experience at Kabalebo, located in a beautiful and pristine corner of Suriname. 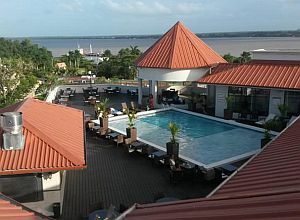 I especially like the resort in Suriname. Enjoyed seeing the space center in F.G. All local guides were very knowledgeable and spoke clear English. Loved the small buses. Ample room for all. Our tour leader was always very knowledgeable and helpful. The hotels on this tour were excellent. I truly enjoyed the stay at Kabalebo Nature Resort. It was a wonderful mix of comfort and nature, and the staff at the resort were lovely. I wouldn't eliminate anything. The excursions were a nice mix of history, nature, and culture, which made the overall trip well rounded and interesting. Great local guides, as usual. The meals very much met my expectations. Great selection and big servings. Our tour leader was extremely well organized. Covered every detail with perfection. The hotels were excellent. Another wonderful adventure. Thank you again for making these trips possible. I hope my friends follow my advice and book with you! Adventures Abroad does a very good job of leading tours to off-the-beaten-track places, guaranteeing a reasonably comfortable hotel with nice amenities, good food, lots of the best sightseeing with great guides, flexible flight planning before and after the tour, and for a reasonable price. Countries you might not want to go to on your own, you can visit with Adventures Abroad in safety and comfort, sharing the cost with other tour members. I very much enjoyed Georgetown, the Devil Island tour, and the amazon experience. The transportation used on this tour was terrific. I enjoyed the whole thing. The meals were also terrific. Our tour leader was clearly the best tour leader I have had in my 5 trips. She is mature and very capable of handling issues that arise. I was very happy to see someone with experience and a very enjoyable personality. I was pleasantly surprised and very happy with the hotels used on the tour. Very enjoyable trip. Thank you very much. I particularly enjoyed the time spent at Kabalebo Nature Resort, seeing the area by the river in canoes, walking on a path thru the Amazon rain forest to see the various birds, animals, trees etc. I enjoyed the people and the sights most. We have travelled a lot and I can say with confidence that our tour leader was one of the most personable, capable and knowledgeable guides we've had on any tour. His people skills were called on several times and he did a superb job leading a group of 18. He related very well with the local guides and the members of the public that he encountered. We felt that the hotels were very good for the areas we were visiting. Overall it was an excellent experience. Local guides were wonderful. Our tour leader was extremely knowledgeable, a good communicator, and always ensured we had all we needed. Wonderful holiday, will be recommending to friends. Today we arrive in Georgetown, the capital of Guyana and one of South America's lesser-known locations. Named after King George III, Guyana's capital city lies on the Atlantic coast, on the east bank of Demerara River estuary. Today the city is protected by a sea wall and an elaborate drainage system designed by the Dutch. Called the garden city due to its wide tree lined avenues, this city is a little piece of the colonial past in a modern world. Built mostly of wood, Georgetown is an architectural wonder with many of its buildings dating back to the 18th and 19th centuries. Today we will enjoy a city tour of Georgetown's principal sites. Here the architecture of centuries gone by will surely provide for some scenic views. 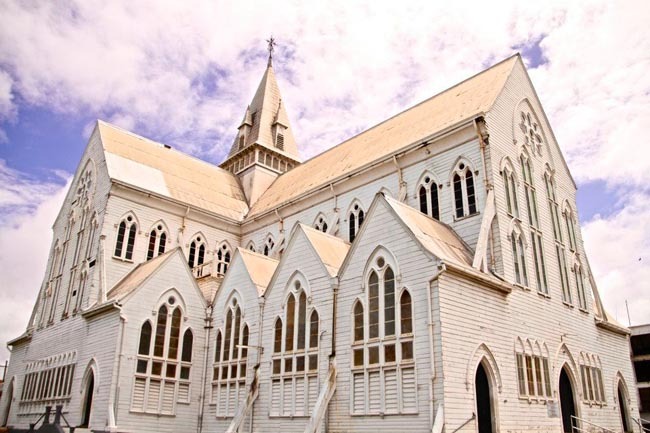 We start at the Kingston Seawall and then drive to the historical center to view St George's Cathedral, one of the world's tallest free standing wooden buildings. We will also see the Parliament building, completed in 1833, as well as the simple but impressive St. Andrews Kirk. We also see the Victorian Law Courts and Town Hall, as well as the historic Starbroek Market - one of the city's most prominent landmarks. Nearby is the Walter Roth Museum of Anthropology where we make a stop. After a break for lunch we will tour the Guyana National Museum. The Castellani House is a gorgeous wooden building erected in 1877. Today this building is home to the National Art Gallery as well as rotating art exhibits by many local artists. Today we depart Georgetown and travel to Kaieteur Falls by plane (approximately 1 to 1.5 hours). We will witness Guyana's astonishing Kaieteur Falls, where the Potaro River drops drastically over a precipice into the depths of a gorge 224 m (741 feet) below. This is the highest 'single-drop' waterfall in the world, and one of the most impressive and beautiful sights in the country. Guyana's ‘trademark feature’ produces breathtaking rainbows across the gorge (hopefully the weather will be clear!). Our aircraft will circle the falls, giving views to those sitting on both sides of the plane, before landing nearby. From here we will walk through a tropical gorge, stopping at a number of viewpoints along the way. There are many legends of Kaieteur, but the most enduring tells of a great old chief of the Patamona tribe whose name was Kaie. To save his people from being destroyed by the savage Caribishi, Kaie sacrificed himself to the Makonaima, the Great Spirit, by canoeing himself over the falls. After our time at the falls we then fly to the Baganara Resort. 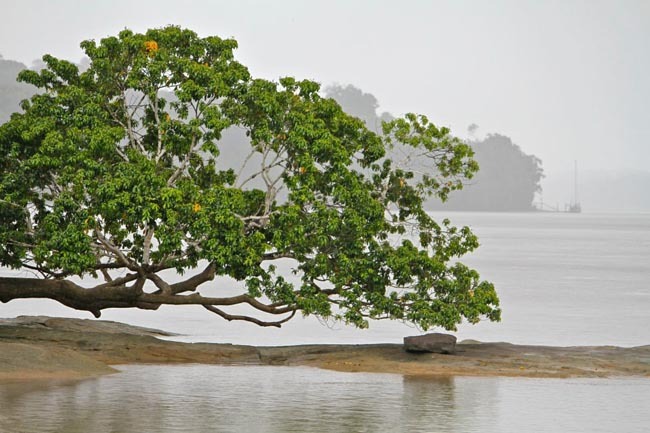 Pre-eminent among the three hundred and sixty-five islands in the mighty Essequibo is this wonderful little piece of paradise with one hundred and eighty-seven acres of lush green foliage and colourful tropical flowers. This is the gateway to the unspoilt rainforest of Guyana and the junction where the great Essequibo and Mazaruni rivers meet. 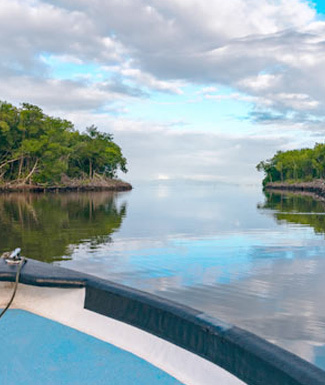 In the afternoon you may have some free time and then early this evening, as the sun starts to set, we make an excursion up the Essequibo River by motorboat to Parrot Island. As the warm tropical day ends, myriad stars of the equatorial zone appear and the Amazonian parrots arrive to roost for the night. We will approach the edges of this mangrove island listening to the sounds of these intelligent birds preparing for the night. 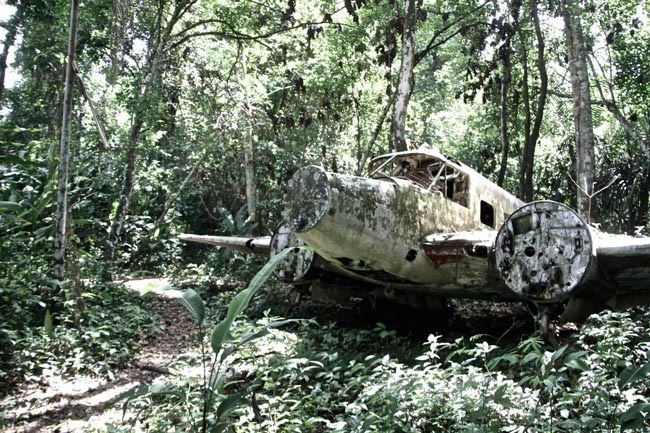 * For our time at Baganara (and later at Kabalebo in Suriname), please pack a smaller collapsible overnight bag due to the nature of light aircraft used to / from these lodges. Your larger baggage will be securely stored for you. Today we rise early in order to enjoy a 'pre-breakfast' nature walk. Our walk takes us through the humid swamp forests that cover part of Baganara Island. This is a perfect opportunity to identify some of the regions numerous tree species and watch for some of the more than 200 bird species recorded in the surrounding area. After breakfast you may want to enjoy a swim in the warm, clean waters of the river, or perhaps relax on the soft sand beaches that surround the island. We will stop at Fort Zeelandia where we visit the fort and museum before continuing to Georgetown for our overnight. This morning we fly from Georgetown to Paramaribo, Suriname. Suriname is the smallest country in South America, with a population of just over half a million people. Set in a natural tropical wilderness, Suriname offers a splendid combination of the Caribbean and South America, with fascinating reminders of a sometimes turbulent past. Dominated by mighty rivers that provide essential highways into the rainforest and jungles of the interior, much of Suriname remains virtually untouched. Paramaribo is a former Dutch colonial town from the 17th and 18th centuries planted on the northern coast of tropical South America. The original and highly characteristic street plan of the historic centre remains intact. Here one finds black-and-white colonial Dutch buildings lining grassy squares, and in 2002 the historical inner city was listed as a UNESCO World Heritage Site. 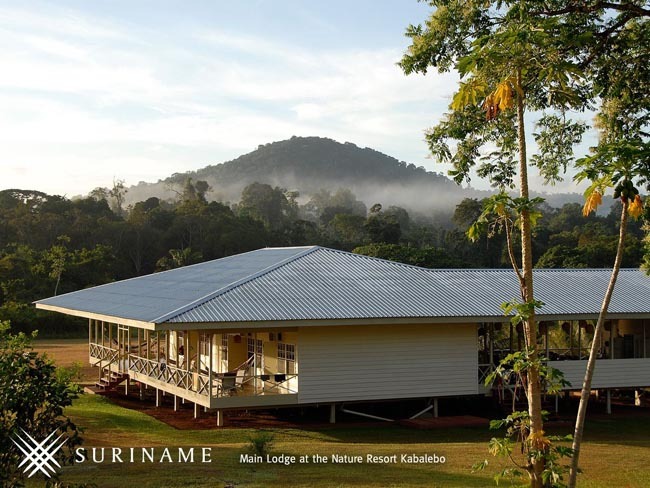 Upon arrival in Paramaribo we will connect with our flight to the Kabalebo Nature Resort, a beautiful lodge lying in one of the most beautiful areas of Suriname, deep in the untouched (and malaria free) Amazon rainforest. Accessible only by air, this is an area of pristine uninhabited Amazon jungle in the western part of Suriname. The precise spot can be narrowed down to the area of the Bakhuys Mountain at the Kabalebo River. Within a range of hundreds of kilometers one finds nothing except for the flora and fauna of the splendid Amazon rainforest. Here playful monkeys leap through the treetops, colourful parrots glide above your head and unusual fish leap and quickly swim away down a secluded creek. The name “Kabalebo” in the language of the Caraib Amerindians means, “arch in the river”. 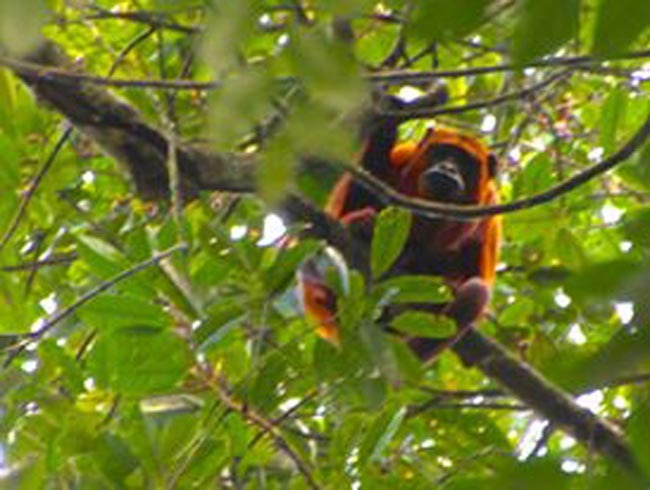 Though wildlife sightings are commonplace, excursions into the jungle will increase your chances of seeing more exotic creatures. Our schedule over the next 3 days is kept flexible on purpose, and will be adjusted to meet the interests of the group. Our planned itinerary for today will be to enjoy lunch upon arrival. After lunch we will enjoy a walk through the forest on one of the trails to the BWKW rapids. After the easy hike you will have the opportunity to refresh in the river or relax on its banks. In the afternoon we will drift by boat (dugout canoe) back to the lodge. While drifting back you can enjoy the wonderful nature surrounding you. In the evening diner will be served, and you will be able to enjoy one of the delicious Surinamese dishes that the cook/chef has prepared. Overnight at Kabalebo Jungle Resort. This truly is one of the most beautiful pieces of jungle in Suriname. Because no people live in the wide surroundings, pure untouched nature is found here. 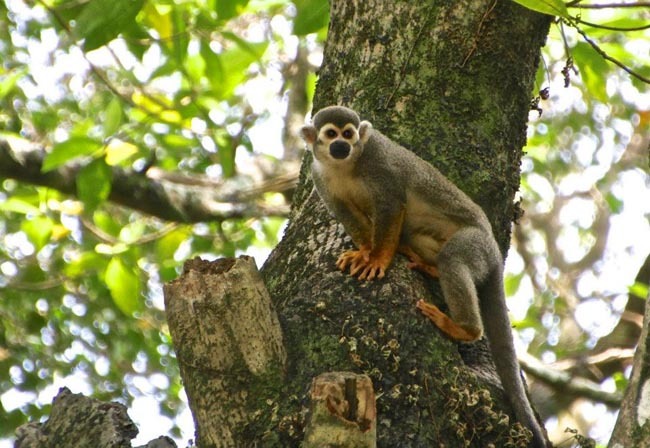 The resort lies in the middle of the Amazon jungle, and exotic tropical animals will surround you. During our time at the resort you will have the opportunity to enjoy jungle walks or hikes, during which we will become acquainted with the extensive flora and fauna of the Amazon forest. You will be introduced to the numerous inhabitants of the rainforest. Our guides will tell us about the animals making their home in this area and the medicinal qualities of the plants and jungle flowers. Because of the unique location and biodiversity, nature lovers will certainly have the time of their lives. This region is also a true birders paradise, and the bird count at the property includes more than 250 different species. The balance of the day will be free for activities, including short walks / nature hikes/wildlife viewing/boat trips/and more. Overnight at Kabalebo Nature Resort. Today we continue to enjoy the resort. Perhaps today we will enjoy another interesting forest walk, or drift downstream in a canoe. The resort has miles of landscaped paths where you can simply wander and enjoy the best of what nature has to offer. Some of the birds that you might encounter include the Blue headed Parrot, Black Skimmer, Aracaris and the Buff Throated Saltator. This morning we will depart by charter flight back to Paramaribo. On arrival we have a city tour. At the central market you can find tropical fruit and vegetables galore, and here one can meet a cross-section of Suriname's ethnically diverse population. We will stop at the Neveh Shalom synagugue, standing in the centre of town next to the largest mosque in the Caribbean. 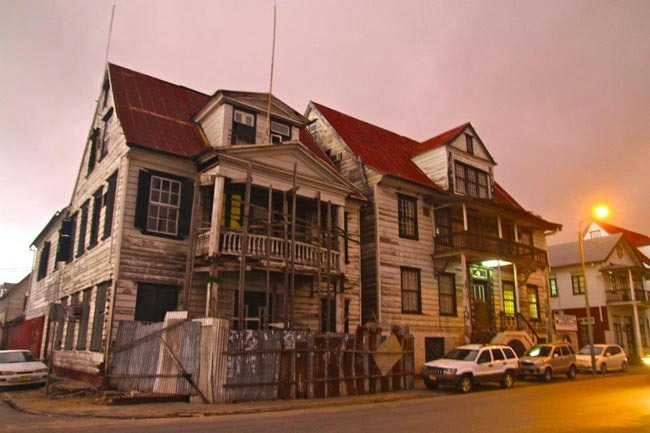 As we explore part of the city on foot we will witness the diversity of Paramaribo, including the monuments and historical buildings in and around the city center that were added to the World Heritage List by UNESCO. The Palm Garden, which is behind the Presidential Palace, is famous for its stately palm trees, and the Waterfront (Independence Square) is the centre of activity during national holidays. Here one often finds several food stands! We will see the historic Fort Zeelandia, which has been turned into a museum highlighting Suriname's history and arts. This afternoon we transfer to the Albina River where we board a boat and cross over to French Guiana. 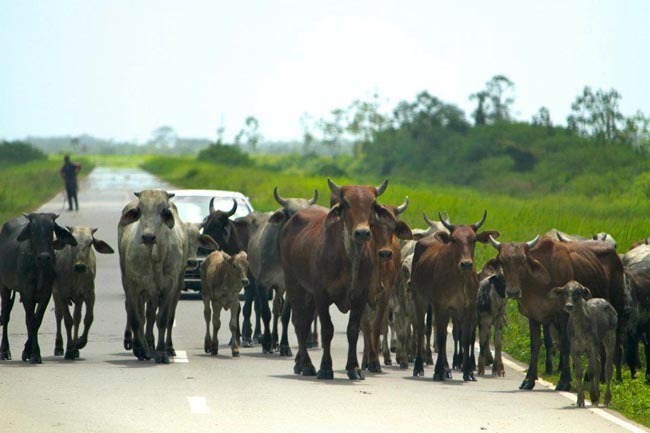 We then proceed by road to Kourou. This overseas département of France is situated on the northeastern coast of South America, bounded by Brazil to the south and east, Suriname to the west, and the Atlantic Ocean to the northeast. 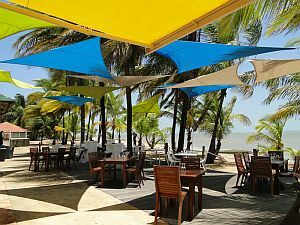 Here the Kourou River empties into the Atlantic Ocean, and at the mouth of this river sits the town, ringed by four hills. Not much is known of the pre-colonial era, but we do know that mostly Kalina or Galibi peoples populated the area before the arrival of the French in the late 17th century. This morning we have a tour of Cayenne, French Guiana's atmospheric capital and the chief port. French Guiana’s cultural milieu reflects the diverse background of the resident ethnic communities. Indigenous and African crafts, customs, and arts predominate among their respective peoples. A distinctive mixed-Creole culture is dominant in the urban areas, highlighted by brilliantly coloured and distinctively patterned costumes. Avenue Général de Gaulle is the main commercial street in the center. At the east end of the avenue near the coast is the Place des Palmistes and the Place de Grenoble. Most of the city’s official buildings are located in this area, including the Hôtel de Ville (the town hall) built by Jesuits in the 1890s, the Post Office, and the Préfecture. Other points of interest include the Canal Laussat and the Botanical Gardens. In the center of town we also find the Musee Departamental, featuring exhibits on indigenous peoples and the notorious penal settlements on Devil's Island. Lively cafes and market stalls are to be found in the Place des Palmistes. Today we enjoy a full-day excursion to the former penal colony on the Iles du Salut (Isles of Salvation). Commonly referred to as "Devil's Island", this is really a triangle of three islands situated seven miles off the coast of Kourou. This famous (or infamous) archipelago lies about an hour out into the Caribbean and consists of: Ile Royale, Ile St Joseph and Devil's Island (Ile du Diable - inaccessible for visitation). The islands played a central role in French history as far back as 1792 when they were first employed as a transit point, first for explorers, then slaves and later for political prisoners. It was here that more than 30,000 French convicts died in horrendous prisons. Those who were sent to the islands were traitors or convicts who had proved unbreakable in the prison camps of the mainland colony. Today the islands are attractive and lush, with their flights of stone-cut steps under the palms leading to superb views of the blue sea, and the church framed in scented frangipani trees. Turtles swim in the channel below Ile Royale where once sharks waited for prisoners' bodies to be thrown into the sea. The cells, guards' quarters and administration blocks on Ile Royale have been converted into a hotel and restaurant, and there's an excellent small museum that recounts the history of the place. There's a small church, the remains of a hospital, and a cemetery with memorials to the prison staff. We later return by catamaran to Kourou. This morning we travel a short distance to the Ariane Space Center where we enjoy a guided tour. * Ariane rockets, whose path out over the Atlantic is tracked from Devil's Island, have put two-thirds of all Western satellites into space. This base is by far the biggest source of income for French Guiana, whose only other cash comes from fruit grown in jungle plantations by Mhong refugees from Indo-Chinese wars. Launch schedules at the Center Spatiale Guyanaise (Guyana Space Center) are a closely-held secret so our schedule today may be amended on short notice. The usual visit here includes a bus tour that criss-crosses the center's mammoth facility, including stops at various assembly buildings and control centers. The entire tour is offered in French, but our guide will supply translations along the way. After the space centre tour we travel by road back to Paramaribo (though it may seem logical to fly onward from Cayenne, the lack of and high-changeability of flights, and the inconvenience of the available schedules--mostly through Paris!--result in this overland route). * As our tour dates are confirmed and published well before rocket launch schedules (which tend to be rather fluid and last minute) are known, it is possible that a launch could impact our plans insofar as security lockdowns could curtail or cancel our visit. Though unlikely, if this happens to us, we will substitute other sightseeing in the area. 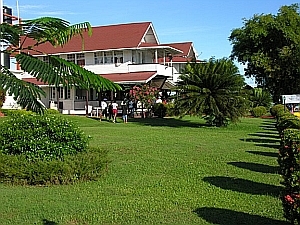 The history aficionado will appreciate a stay at Cara Lodge, Guyana. 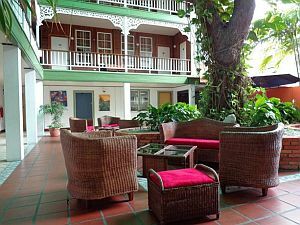 It is one of the oldest and grandest structures ...	Georgetown, and is the best known and most popular hotel in Guyana. Cara Lodge was built in the 1840s and originally consisted of two houses. 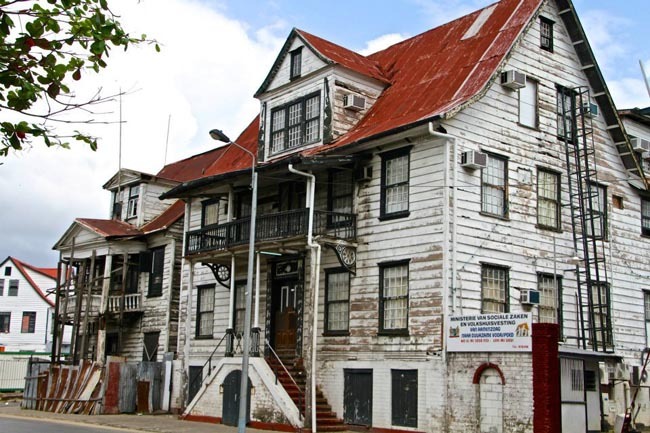 It has a long and romantic history and was the home of the first Lord Mayor of Georgetown. This family-founded lodge consists of 10 fully self-contained superior rooms withspectactular views of the Mighty Essequibo River. Pre-eminent among the ...	hundred and sixty-five islands in the mighty Essequibo is this wonderful little paradise with 187 acres of lush green foliage and colourful tropical flowers. Enjoy a refreshing tropical getaway at our Ramada Paramaribo Princess Hotel, a casino hotel! Choose ours over other Paramaribo hotels ...	our fine dining and entertainment and our prime location near restaurants, casinos and shopping. Our affordable hotel rates account for free parking, free continental breakfast and free Wi-Fi Internet access. 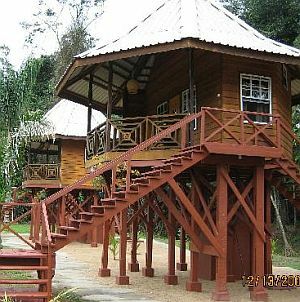 Kabalebo Nature Resort is a luxurious lodge lying in one of the most beautiful areas of Suriname, Deep in the ...	and malaria free Amazon jungle. 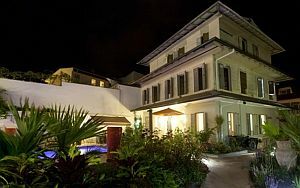 A 6-minute walk from the Place des Palmistes main square, this modern hotel in a converted Creole house is also ...	km from Plage De Montravel beach. Bright accents, original artwork and bespoke furniture give a stylish touch to the relaxed rooms. The Hotel des Roches terrific location by the sea shore right across the Devil Island makes it the perfect choice ...	tourists and business travellers alike. Breakfast and dinner daily (hotels and local restaurants). All transport (including internal flights) accommodation, sightseeing and entrance fees for sites noted as "visited" in the detailed itinerary. Gratuities for local guides, drivers, restaurant staff, porters. Airport transfers for land & air customers and for early arriving/late departing land & air customers who book their extra hotel nights through us. International airfare to/from the tour. Tour Leader gratuity, some lunches, drinks, personal items (phone, laundry, etc), departure taxes, domestic and international air taxes (if applicable). Airport transfers for Land Only customers. Optional trip cancellation insurance. Suriname visa (in advance, all passports US$100). Our post-reservation trip notes offer further guidance on optional meal costs, shopping, packing, advance reading, and locally paid departure taxes. This tour occurs twice a year, outside hurricane season and during the drier/slightly cooler and less humid season (Nov-May). That said you must be prepared for sticky heat at this destination. Local land transport provided by air-conditioned bus, minibus, and/or taxi. Kaieteur Falls and Kabalebo flights via light charter aircraft. This tour is not strenuous per se, but our "2" level rating refers to the ambitious nature of the itinerary, the remote locations covered and the tropical heat, and several activities (ie jungle walks) that one must be prepared for in order to fully enjoy all elements of this trip. For our nights at Baganara and Kabalebo, you must bring a smaller bag max weight 7 kg/15 lbs due to the nature of the light aircraft used. Larger bags will be kept securely during this time. Well-located, air-conditioned, mid-range (3 & 4 star) hotels/resorts with en suite toilet and bath throughout (probably shower only - no bathtub). Single rooms are limited in number and likely smaller than doubles. Porter service is usually available though you should be independent with your luggage, especially at airports and ferries. Please click on "Map & Hotels" for more details.